Local Leaders Talk Shutdown Effects in D.C. While hotel bookings, restaurant sales and incomes sank during the government shutdown, D.C. Mayor Vincent Gray reported an increase in alcohol sales. The District has been running on emergency funds -- blocked from spending its own tax dollars. Thousands of federal workers in the city and beyond have been furloughed, resulting in a loss of retail and restaurant tax revenue. "[During the shutdown, we've had] 13,000 fewer hotel bookings and about a $2 million loss in revenue," Gray said. "The one area where we've seen an increase is the alcohol tax has increased in the District in Columbia. I won't try to speculate as to why." Alcohol sales increased 3 percent in the first week of October 2013 compared to the first week of September 2013. 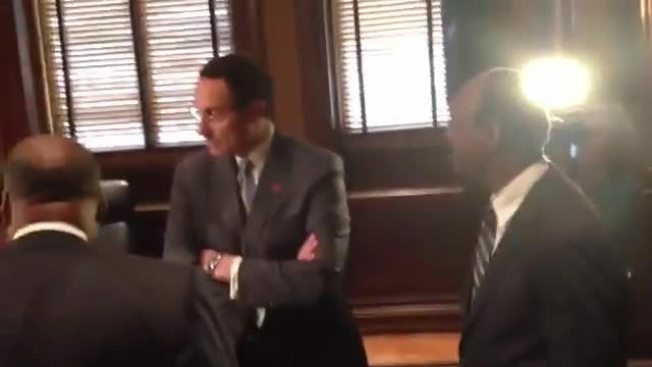 Gray held a joint news conference Wednesday with Fairfax County Board of Supervisors Chairman Sharon Bulova; Montgomery County Executive Isiah Leggett; and Prince George's County Executive Rushern Baker. The four leaders represent 2.5 million D.C. area residents, many of whom were gravely affected by the shutdown. Bulova said Fairfax County's 25,000 federal workers have lost $150 million in income each day of the shutdown, while Baker said 16 percent of Prince George's County is employed by the government.